Thank you very much for your time. I would like to show that I highly appreciate your answers. 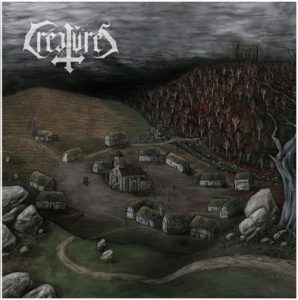 Créatures released, in 2016, the band’s début full-length album, titled “Le noir village”. Could you give an overall idea about the concepts or topics that you write about? What are the main aspects that the band enjoy creating lyrics about? Sparda – Hi Marcus and Metal-Maniac’s readers, thank you for the invitation! In “Le Noir Village”, I talk about the story of a fictional twelfth-century countryside village called Le Cloaric. There is something wrong in this place: a Werewolf appears during full-moon nights; a bloodthirsty monster hides in a castle in Eberulf’s Forest; locals know a rite to make a pact with the Devil; some people mysteriously come back to life after death… All the lyrics are conversation between inhabitants and monsters or monologues. The 10 characters of my tale are being theatrically enacted by different singers who are first person narrators to help the music tell the story. Still concerning the composition aspects, how does the song writing work as well as the lyrics? Do you intend to keep this opera style story-telling of the village getting attacked by terrifying monsters? In addition to that, how did you come up with this idea? Sparda – I am a huge fan of King Diamond because I am fascinated by his way of composition. He creates concept albums around stories he wrote, his music reflects the acts of the plot or the feelings of the characters, and he plays their role by singing. That is totally what I tried to do in Créatures. Each character has his own melody when he speaks, the music can be peaceful when a father is with his son or violent during a fight with a monster, calm at the morning or horrific at night, religious during divine interventions or inquisitive during a trial etc. I also use many samples to help the listeners to understand the plot of the story, even if he does not speak French. In addition to the previous question, could you tell us what inspires you to play this musical style and impulses your creativity. And when it comes to your musical process, what influences the band? Not only when it comes to other bands, other musicians, but overall, what influences you in your creations? Sparda – I always thought that the horror atmosphere is not enough represented in the metal scene, even if it perfectly fit with it. There are some horror metal bands such as King Diamond, Gloomy Grim, Tartaros, Notre Dame, The Vision Bleak… but not that many, so I tried to fill the void. I really like bands which experiment (Krallice, The Ruins of Beverast, Dodheimsgard, Ved Buens Ende), try new things, mix different kinds of metal or metal with other kinds of music. 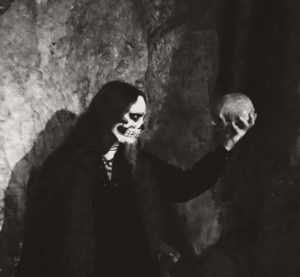 That’s why in Créatures I blend black metal with doom, death, heavy, thrash, symphonic, acoustic, ambient… and why I use atypical instruments like theremin, church organ, piano, trumpets, or violin. Concerning the world I created in Le Noir Village, my principal influences come from horror video games like Resident Evil, Silent Hill, Forbidden Siren, and from the classical horror figures in movies and literature. Personally, I enjoyed very, very much “Le noir village”. It is a fresh, interesting and unique release. It has an eerie feel, atmospheric and experimental. There’s extreme beauty in it. How has been the response from the critics and admirers of your music so far? And if you may say, the band was founded in 2008, could you share with us the reasons why it took eight years to release a full-length album? Sparda – Thank you for the compliments! I am alone in Créatures, that’s why it took me eight years to make such an ambitious piece: creating the concept, writing the lyrics, composing the whole album (which lengths one hour), recording every instruments by myself and every guests, mixing alone and then working the sound with I Luciferia (from the band Reverence), working with the painter Simon Hervé and the designer Roy de Rat for the digipack, and finally releasing it with my own label Antiq. Every critic admired this impressive work and the ambition of the project, unusual in the underground scene. I am very happy because for the time I have just one bad review for something like twelve reviews around 16/20. Créatures blends many metal styles, creating something unique, called horror metal by you. I guess we can say that the music is also experimental, but not in a way that it is completely weird. What drew you to play an experimental form of metal music? Why did you decide to work on a such complex musical style? Sparda – The main reason is that Créatures is a solo project. I can express myself entirely in it, doing everything I want without making concession with other members. That’s why the album sounds so crazy. If I think it’s pertinent for my story to put two minutes of ritual ambient with Asiatic instruments in the middle of a song (have a listen to: “à l’orée du mal le pacte interdit”), I will do it, even if it’s risky because it could be boring for the listeners, I don’t care. Le Noir Village contains many many melodies and riffs, there is no hackneyed parts for any instrument during the whole album. I am sure that even after 50 listening, you can still discover something you have never heard. I like this feeling when I listen to an album. Let us know a bit about your relation to metal music. We all have the first record, the first time we got in touch with metal music. How and when did you get in touch with the genre? Which aspects draw your attention and which were the main motivations to create a band? Sparda – I came to my first metal concert when I was 10. It was a local thrash metal band called Arcania (now they play amazing progressive thrash/heavy) and I was really impressed by the violence of their music. Six years later, I began to play bass guitar with my folk black metal band Hanternoz. Playing and creating music was a very grateful feeling so I quickly learned other instruments (guitar, piano, singing) and tried to compose and record alone. That lead to the first demo of Créatures (at that time the one man band was called “Horror Freak”) in 2008 when I still was minor. The French extreme Metal scene has always been very rich, perhaps my favourite one. In my modest opinion, you can find very interesting band in every style and that for quite some time as well. How do you personally feel about the current state of the scene? 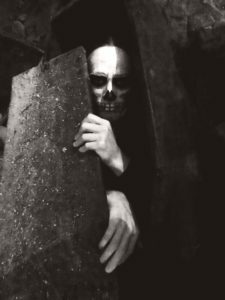 Sparda – Yeah, we have many amazing bands: from the most elitist underground black metal of the Black Legions to the internationally famous progressive death of Gojira. I feel that there is something more extreme and crazy in France with bands I adore like Diapsiquir (urban pop-black-indus), Spektr (jazzy black-indus), Igorrr (electronic baroque mathcore), Pryapisme (8bit-metal), Peste Noire (medieval black), Pensée Nocturne (depressive black), Borgia (Christian black-doom-death) etc. But I am not “ethnocentrist” anyway, most of my favorite bands come from all over the world (USA, Germany, Poland, Japan, Australia, Finland…). I am very interested in other cultures and histories. As in every single interview I conduct, I like to ask a few personal questions simply to know a little bit more about the man behind the music better. And as I always add, nothing intrusive, of course. I just would like you to share favourite activities, hobbies, movies, what you usually prefer doing at your free time. Sparda – Most of my free time is dedicated to music because it is my life. I spent hours listening to bands from many styles (metal, traditional folklore, religious, classical & baroque, rap, electronic…), I compose and record for several bands including Créatures, Hanternoz, Ê (oriental doom-death), Dormin (new ritual ambient solo project), I collect and practice many instruments and percussions from all over the world, and I run my own label Antiq with my friend Hyvermor. Outside music, I also like playing video games and watching movies/series, but with my professional activity it is hard to find time for these hobbies. What do you believe that the future holds for Créatures? What are your main goals and wishes for the upcoming days of the band? Sparda – I would like to find session musicians to play concerts with a theatre set and costumes, but for the time it is quite impossible. Soon, I will begin to write the story of the second album with a friend of mine who is writer, and to compose the music. I hope this time it won’t take me 8 years to release it. And so we reach the end of this conversation, this interview. One more time, thank you very much for your time and answers. In addition to that, I would like to wish you all the best in your personal and professional plans. I leave you with the last words of the interview. Sparda – Thank you very much. 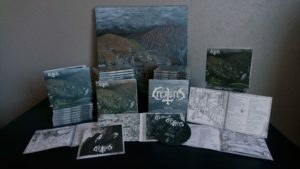 Guys, if you are curious and intrigued by Créatures, don’t hesitate to listen to the album on bandcamp. The physical album is a beautiful digipack with a 16-page booklet containing a painting and six medieval-inspired drawings made specifically for this release. We also made cool t-shirts and sweat-shirts you can find on Antiq’s bigcartel. A big thank you to Noémy from Solstice Promotion for helping in getting this interview.